No one stressed the texts more than Nichiren. Both texts and people coexist. Only in Zen and the Nichiren Shoshu is there asserted a mythical world existing without texts. The root is the text. The text has existed since the infinite past. The text is both the teacher and the relic of the Buddha. The text is the Dharma itself. Both an excellent doctrine and an excellent believer is necessary for the transmission of the Buddha's teachings. The Eternal Buddha lives today. The Gohonzon is the Eternal Buddha. The Gohonzon is a text. Zen teachings have lead to the belief that the Sutras and texts are not important, only self-attained Buddhahood or "Mind to Mind transmission" which occurs "apart from the Texts." More so, the Nichiren Shoshu and Soka Gakkai stress secret transmissions and personal epiphanies while Zen, as Nichiren teaches in The Conversation Between a Sage and an Unenlightened Man, in reality, bases itself on texts. The Fuji schools are more Zen than Zen itself. "From the viewpoint of the Daishonin and the Patriarchs of the Tien-t’ai Sects, people confuse the Specific with the General and General with Specific. They confuse Specific, "Face to Face transmission" from Patriarch to Patriarch, or High Priest to High Priest, with General "Mind to Mind" Transmission based on texts, or "Mind to Mind transmission," "apart from texts" and based on particular peoples capacity in the realm of Self-Realization. Chih-i repeats over and over, and so do Chang-an and Miao-lo, that the Middle Way is correct, but people fail to grasp what this means and continue to be hung up on certain points." I disagree. Nichiren Shoshu is not even Buddhism. How much less so the Middle Way? >>>>>A Priest named Ganjin, who was the founder of the Japanese Ritsu sect, had brought Chih-i’s writings to Japan and Saicho (Dengyo) first studied these texts of Tien-t’ai Buddhism, and began to teach them in Japan, founding a small temple called, Hiei-sanji, at Mt. Hiei. In 804, he went to China and studied under the disciples of the High Priest Miao-lo, Tao-sui and Hsing-man, and received the transmission of Tien-t’ai Buddhism. He returned in 805, to Japan, to officially found the Tendai Sect. Dengyo’s original temple at Mt. Hiei was renamed Enryakuji Temple by the Emperor in 723. With the principles of the Tien-t’ai sect as the true Buddhist teaching for the Middle Day of the Law, Dengyo had begun petitioning the Government for the establishment of the National Sanctuary of Mahayana Buddhism at Mt. Hiei. For his remaining, 17 years, against much criticism and antagonism from other sects, Dengyo continued his resolve. The government did finally approve this project one week after Dengyo passed away, and finally, five year later, Dengyo’s successor, Gishin, had officially founded the National Sanctuary of the Mahayana Ordination center at Enryakuji temple. This temple was the place where the Daishonin did his most intensive study of Buddhism. The meditation which Chih-i taught was very widespread. The Ch’an Sect, which was the ancestor of Japanese Zen, used Tien-t’ai meditation, even calling him a founder of Ch’an. Ch’an (Zen) taught a number of contradictory teachings. They first teach of a "mind to mind" transmission directly from Shakyamuni to the "28 Successors" of Ch’an (Zen), which is said to be passed down apart from the Sutras. Jumping from a slightly different variation of the "24 Successors of Shakyamuni," including Nagarjuna, on to Arya-Simha, the Succession then jumps to three additional Priests, and then to Bodhidharma, called the fourth patriarch of Ch’an (Zen), but is usually considered the founder. Actually, Dave is mistaken. Not even Tientai, is to be followed in Mappo, let alone Miao-le. Only Nichiren the Supreme Votary is to be followed in Mappo. Why the Nichiren Shoshu adopted the Zen teachings on Patriarchal transmission, one can only guess but Nikken erected a tombstone in a Zen cemetary. "Kuden transmission was a common practice of the Tendai Sect and derived from the false belief that the enlightenment of various teachers, "Shikan" or personal insight, trumped the wisdom of the scriptures. This is a dangerous teaching according to Nichiren because it destroys faith in the Scripture of the Fine Dharma of the Lotus Flower Sutra. Embracing such a false doctrine, one comes to the mistaken belief that personal insight may reveal things that contradict or superscede the teachings of the Buddha. It relies on the notion that there are "Kuden" (secret teachings) that can be passed by hand [or mouth] and in the case of the Nichiren Shoshu teachings that Buddhahood itself can be "passed" from one "Tetsugi Master" to another. The origin of secret transmission doctrines within the Tendai Sect was largely a response to the gentrification of the Priesthood as more and more nobles entered the priesthood and some means had to be found to short circuit the years of training and demonstrated mastery otherwise required in order to qualify a priest for the Chief Priesthood of a Temple. It also was based on the incorrect notion that since enlightenment is found within all beings there is no need for cultivation of enlightenment or use of Buddhist logic. Masters could awaken and pass on hidden meanings. The extreme extension of the logic is the Zen Sect. Nichiren Shoshu's use of it is no less poisonous. Such a "transmission" is useful to quell not only dissent but legitimate questions. "In actuality, however, the essential teaching bears no resemblance whatsoever to the theoretical teaching. The preparation, revelation, and transmission of the essential teaching are intended entirely for the beginning of the Latter Day of the Law. The essential teaching of Shakyamuni’s lifetime and that revealed at the beginning of the Latter Day are both pure and perfect [in that both lead directly to Buddhahood]. Shakyamuni’s, however, is the Buddhism of the harvest, and this is the Buddhism of sowing. The core of his teaching is one chapter and two halves, and the core of mine is the five characters of the daimoku alone. Question: On what authority do you say [that the essential teaching is meant for the generations of the Latter Day of the Law]? "Answer: In this passage, Shakyamuni Buddha explains that he is entrusting to the Bodhisattvas of the Earth, his original disciples, the five characters of Myoho-renge-kyo, which is the essence of the Lotus Sutra. Shakyamuni, who attained enlightenment countless kalpas in the past, says elsewhere, "By now the original vows that I made have already been fulfilled. I have converted all living beings and caused them all to enter the Buddha way." Thus, he has already fulfilled his earlier vow. Then, intending to charge his disciples with the task of accomplishing widespread propagation in the fifth five hundred years after his death, he called forth the Bodhisattvas of the Earth and entrusted them with the heart of the sutra, the lotus of the entity of the essential teaching. This passage represents the ultimate purpose for which Shakyamuni Buddha appeared in the world, the secret Law that he attained in the place of meditation. It is this passage that gives proof of the lotus of the entity that, for those of us who live in the Latter Day of the Law, assures the attainment of Buddhahood in both the present and future." "It is the five characters of Myoho-renge-kyo that constitute the Great Pure Law that will be spread widely in the Latter Day of the Law. And it is the great bodhisattvas who sprang up from, the earth in numbers equal to the dust particles of a thousand worlds who were entrusted with the task of spreading it abroad. Therefore Nan-yueh, T’ien-t’ai and Dengyo, though in their hearts they understood the truth, left it to the leader and teacher of the Latter Day to spread it widely, while they themselves refrained from doing so." "Accordingly, at the present time in the Latter Day of the Law, other than the envoy of the Thus Come One, there can be no one who understands and produces this passage as proof of the lotus of the entity. Truly it is a passage of secret meaning. Truly it is a matter of great concern. Truly it is to be honored and admired. Namu-myoho-renge-kyo, Namu-myoho-renge-kyo!" "The leader and teacher of the Latter Day" is specific to one man, Nichiren Daishonin (Bodhisattva Jogyo). "Bodhisattvas of the Earth" is general to all those who follow Nichiren. There are not superior and inferior Bodhisattvas of the Earth. The responsibilities of laymen and priests are blurred in Mappo and there is only one High Priest and one leader, Nichiren Daishonin. Question: The Lotus Sutra states that there are many leaders of his own great assembly with various large and small retinues of followers. Wouldn't that mean Daisaku Ikeda, the High Priest of the Nichiren Shoshu, the Chief Bishop of Minobu. Nikkyo Niwano, and others? Answer: At this time, there is only Nichiren Daishonin and his followers. Those who follow Nichiren Daishonin and are of the same mind as he ["The bodhisattvas, as numerous as the dust particles of a thousand worlds, who emerged from beneath the earth and (who are) the followers of Shakyamuni Buddha present in our lives"] are indeed leaders of his own great assembly with various large and small retinues. Daisaku Ikeda, the High Priest of Nichiren Shoshu, the Chief Bishop of Minobu, Nikkyo Niwano, and Nissen however, are not of the same mind as Nichiren. Nikkyo Niwano, despite chanting the daimoku, failed to even acknowledge Nichiren Daishonin as the leader of the Bodhisattvas of the Earth. Daisaku Ikeda and the High Priest of Nichiren Shoshu throw out Shakyamuni Buddha. The Bishop of Minobu allows all sorts of sundry practices and a false transmission between priests and lay believers [not to mention interfaith] and Nissen proclaimed his joy to have been born in a Buddha-less world. Since they are not of the same mind as Nichiren, they are not his followers and they are not Bodhisattvas of the Earth. Since they are not Bodhisattvas of the Earth, they are not even inheritors of the general transmission. Are mental gymnastics necessary to maintain faith in the Nichiren Shoshu or Soka Gakkai? No, only a willingness to believe fairytales. The Sly Fox branch of the Nichiren Happon Haha branch is one such sect and the Nichiren Python sect is another. The former cons their members out of their money and the latter squeezes the money out of them. 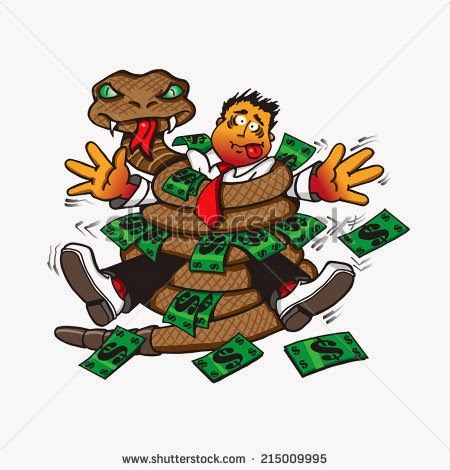 The Soka Gakkai has adopted the most effective money collecting strategies from both sects and is now known as the Sly Fox Python branch of the Fuji school, otherwise known as the Ikeda sect. Today it is the false doctrines propagated by the "three Great Teachers disseminated from Taisekei, Shinanomachi, and Minobu that will destroy the nation [of Japan]. Why doubt SGI mentor-disciple and Nichiren Shoshu succession through High Priests doctrines? Because they are not clearly stated in the Sutra or the writings of Nichiren. The Transmission is a plane, a pyramid or a sphere? Nichiren Shoshu teaches the specific and general transmission as a vertical [specific] line from high priest to high priest and a horizontal [general] line from high priest to believer. SGI teaches that the transmission is a pyramid with Daisaku Ikeda at the top, the leaders in the middle, and the general members at the base. Chant and study hard without the commentaries and footnotes of Daisaku Ikeda, your priests, or leaders and see if you come to the same conclusions as they. Nichiren believed that denying the truth of the Lotus Sutra, was the most serious of sins. Nichiren referred to this as "Hobo" (Slander of the Dharma). He warned that those who denounce the truth of the Lotus would suffer in the deepest Hell. Because, the Lotus Sutra promises salvation to beings in the "latter, evil age," Nichiren taught that anyone in the age of Mappo who believed in other doctrines, or trusted in evil teachers (like Nikken or Ikeda) were destined for hell. "The Lotus Sutra is the correct path to Buddhahood." "If someone does not believe the Lotus Sutra and slanders it, he kills his seeds of Buddhahood in this life. When his life is over, he will be reborn in the deepest hell. After a kalpa he will be born again in hell, and this cycle will continue for countless kalpas." SGI and NST members are brainwashed cult members who fail to take the Buddha and Nichiren at their word. They lack faith and they are arrogant. Are they something else? "The teachings of the Lesser Vehicle and of the provisional Mahayana were valid only for the people who lived during two thousand years after the extinction of the Buddha. We are living in the first five hundred years after the beginning of the Age of Degeneration. Now is the time to propagate the Lotus Sutra. The Lotus Sutra is the Pure Law, the Perfect Law, the One True Teaching. According to the Daijikkyo Sutra, in the first five hundred years after the beginning of the Age of Degeneration, people resort to fighting, and the right teachings of the Buddha are forgotten. In these years, the provisional teachings are mistaken for the true teachings. Now the teaching of the One Vehicle should be propagated and the provisional teachings criticized. What we should do is criticize wrong views." "I have appeared in Japan in this time of emergency by the order of the Buddha. I dare say that I am not fortunate. However, the order of the King of the Law is categorical. Therefore, according to the Lotus Sutra, I raise the army of the true teaching against the forces of provisional teachings, wear the armor of patience, take the sword of the Wonderful Law, bend the bow of the Revelation of the Truth, fix the arrow of honesty, ride in the white bullock-cart of equality, break the gate of provisional teachings, and hurl criticism at the followers of the Nembutsu, Shingon, Zen, Ritsu, and other sects. Some of them run away or withdraw, while others are captured and become my disciples. I will repeat the offensive. I will march on, although they are many and my friends are few." The leader must be in control of every aspect at all times. When problems arise, immediately find a guilty party to blame. Never point out the reality of the situation. Never express your feelings unless they are positive. Don't ask questions, especially if they are tough ones. Don't do anything outside of your role. Nothing is more important than giving money to the organization. At all costs, keep up the image of the organization or family. Question: Since the beginning of the kalpa of continuance, has anyone become enlightened to the lotus that is the entity of the Mystic Law? Answer: The Shakyamuni Buddha who lived in a past even more distant than gohyaku-jintengo became enlightened to the lotus that is the entity of the Mystic Law. Thereafter in age after age and lifetime after lifetime, he declared that he had attained the way and he revealed the fundamental principle of wisdom and reality (the deep merging or fusion of objective reality or truth and the subjective wisdom to realize that truth, or the Buddha-nature inherent within one's life). In our present world as well he appeared in the kingdom of Magadha in central India, intending to reveal this lotus of the Mystic Law. But the people lacked the proper capacity and the time was not right. Therefore he drew distinctions reguarding this lotus of the single Law and expounded it as three kinds of flowers, delivering to the people of the provisional teachings of the three vehicles. For over forty years he guided and led them with these temporary teachings according to their capacities. During this period, because the capacities of the persons he addressed were so varied, he bestowed upon them the various flowers and plants of the provisional teachings, but he never spoke of Myoho renge kyo. That is why, in the Muryogi Sutra, the Buddha said: "In the past I sat upright in the place of meditation[forsix years] under the Bodhi tree...In these more than forty years, I have not yet revealed the truth." But when he preached the Lotus Sutra, he cast aside the various plants and flowers of the Hinayana doctrines and the provisional teachings, which correspond to the expedient means of the four flavors and three teachings, and explained the unique doctrine of Myoho-renge. When he opened the three figurative lotuses to reveal the single lotus of Myoho renge, the people of the provisional teachings with their four flavors and three teachings were able to gain the lotus of the first of the ten stages of security. (stage of non-regression). Not until he revealed the lotus of 'opening the near and revealing the distant" were they able to obtain the lotus of the highest result, advancing to the second stage of security, the third stage of security, the tenth stage, the stage of near perfect enlightenment and finally, the highest stage of perfect enlightenment. "(The Entity of the Mystic Law). An SGI member wrote: No single right way? Abandon expedient means? "I think what was copied below from the Lotus Sutra (posted by xxxxxx) is great. I truly believe that once people get to a certain point in their spiritual growth, this passage below becomes clear. However, there will always be those who will say that the words mean something else and "what it really means is . . . " be they SGI, NST, HBS, KHK, Christian, etc. People will find their way if they search and it doesn't necessarily mean chanting is the only way. I strongly believe that trying to prove you are right and arguing your point to no end goes against this. The part about "putting down good roots" can be done by anyone just by showing respect to others, IMO. This says to me that there is no single right way, but that different approaches are needed for different people. Everyone who practices the Buddhism of Nichiren chants this passage every time they do gongyo, as this is taken from the Juryo-hon chapter." "Question: When is the time for the preaching of the Hinayana sutras and and the provisional sutras, and when is the time for the preaching of the Lotus Sutra? Answer: Even bodhisattvas, from those in the ten stages of faith to those on the verge of full enlightenment find it difficult to judge matters concerning time and capacity. How then can ordinary beings such as ourselves be able to judge such matters? Question: Is there no way to judge them?" Answer: Nichiren concludes that if we use the Buddhist sutras and not arbitrary opinion, now is the time for Buddhists to spread Namu Myoho renge kyo and Gohonzon ONLY. The time has passed for the other Buddhist teachings to be effective. Nichiren explained this passage according to the "time". Depending on the time, there are different parables, metaphors, doctrines etc. that the Buddha taught. Now, in the Latter Day, there is only the doctrine of the Eternal Buddha (Gohonzon) and Namu Myoho renge kyo. If you do not read this passage through the eyes of a Bodhisattva of the Earth, a votary of the Lotus Sutra, you might make the claim as the Nembutsu, Zen, Shingon and others that, depending on the capacity of the person, the Nembutsu, the Zen or the Shingon faith and practices are correct or it is ok to tell someone, "Just chant Daimoku and you will get whatever you wish." This of course is not the import of the Lotus Sutra nor of Nichiren. We will proclaim abroad [this sutra]. "In the last five hundred years after my extinction, proclaim and spread it abroad in Jambudvipa, lest it be lost and Mara the Evil [One}, his Mara-people, gods, dragons, yakshas, kumbhandas, and others gain their opportunity." "Honestly discarding the provisional teachings I now will reveal the truth." Teachings lose their power according to the time. A horse and buggy is no longer a practical means for transcontinental travel. The provisional teachings are no longer practical today. The teaching that all paths lead to the same place is an absurdity. Mein Kampf is a teaching. It is the teaching of Adolph Hitler. Does this teaching leads to the same place as the Lotus Sutra? No, the teachings of Mein Kampf lead to hell. The teachings of the Lotus Sutra lead to Buddhahood. Even the advanced teachings in the Flower Garland Sutra, for example, the "ten meditations", are useless in this Latter Day because those in the realms of Learning and Self Realization, our scientific and cultural leaders, are precluded from attaining Buddhahood through the teachings of the Flower Garland Sutra. Furthermore, no where in the Kegon Sutra are we exhorted to practice it in this degenerate age. Tientai taught the principle that the higher the teachings, the more people will be able to benefit. The Lotus Sutra is the highest teaching by the Buddha's own admission. Only the Lotus Sutra can benefit those people that the other sutras are powerless to benefit, we the people of this Latter Day. "I appreciate your response. Nichiren Daishonin taught that in the Latter Day we must abandon all expedients and since the SGI is an expedient by your own admission, you must abandon it. We are Honmon. We have abandoned the expedient teachings and teach the truth directly. The SGI and especially your Sensei misunderstand Buddhism. Soren SGI: "Abandon all expedients," Mark? I have to confess, I cannot even begin to imagine how one would do that. Every waking moment of our lives involve expedient means to achieving something; if nothing else, we go on breathing in order to remain alive. Mark: Yes, abandon all expedients. Stop telling people, "you will definitely get that girlfriend if you chant" or " the abolition of all nuclear weapons will be realized in the next several decades, thanks to the SGI". Saying such things are an indication of "arrogant licentiousness". This is not the way to keep people chanting for fifty years as your (SGI's) miserable track record indicates. People will come to hate you for lying to them. People want to hear the Law not the arbitrary opinions of self proclaimed leaders. It is precisely because SGI does not abandon expedient means that you forfeit your right to call yourselves disciples of Nichiren but even more profoundly, you smother the seed to quickly attain Supreme Enlightenment. But when he preached the Lotus Sutra, he cast aside the various plants and flowers of the Hinayana doctrines and the provisional teachings, which correspond to the expedient means of the four flavors and three teachings, and explained the unique doctrine of Myoho-renge. When he opened the three figurative lotuses to reveal the single lotus of Myoho renge, the people of the provisional teachings with their four flavors and three teachings were able to gain the lotus of the first of the ten stages of security. (point of nonregression). Not until he revealed the lotus of 'opening the near and revealing the distant" were they able to obtain the lotus of the highest result, advancing to the second stage of security, the third stage of security, the tenth stage, the stage of near perfect enlightenment and finally, the highest stage of perfect enlightenment."(ibid). Teaching the Human Revolution, Ikeda Guidances volume 1, 2, 3, 4, 5, 6, 7, 8, 9, 10, and the inane snippets of Gosho with hundreds of lines of Ikeda interpretation is not the way to ensure people will chant for fifty years and more or to attain to the higher stages of faith and practice. Youlocast aside the Lotus flower and embrace the Soka weed. You fail to teach the doctrine of Myoho renge kyo. You would do well to follow the lead of your friend who left the SGI for greener Buddhist pastures. If not, you will fail to see your life fulfilled in the manner you envisioned when you first started chanting. This is not a threat, this is an observation. "The Sokagakkai has again been caught with their pants down in yet another banking scandal. The Long Term Credit Bank of Japan was one of the strongest and most relied upon bank for financing huge mega-ventures such as the Rockefeller Center purchase. But now, due to political meddling of the Clean Government party (Sokagakkai's new party), the JDP and LDP of Japan, it is now going fast down the tubes. Sokagakkai has been reported to have invested as much as $7.5 Billion in the LTCB, hoping to rake in huge profits from the bank's many large loans which were due to mature this year. However, because of the Asian economic problems, over $150 Billion scheduled to be paid back has been in default. Including the loan which was made to purchase the Rockefeller Center in NY. All three political parties have invested very heavily in the LTCB. As a result, the scandal that would be uncovered by the complete default of LTCB would devastate all of the political parties involved. On September 22, a summit meeting was held, and executives of the ruling Democratic Party (LDP), the Ministry of Finance and the Depository Insurance Organization (DIO) decided the final policy about what to do with LTCB. Their conclusion was: In an amendment bill of the Financial Recovery Act, the proposals by the opposition parties – Japan Democratic Party and Clean Government Party – will be incorporated. Their intention was to use taxpayer money before finishing the amendment bill to prevent the dissolution of the huge financial scheme. The Clean Government Party of Sokagakkai had its own reason not to let LTCB go bankrupt. It was that Sokagakkai, the largest religious group in Japan, that owns $7.5 billion worth of LTCB bonds. One LDP executive said, "Sokagakkai has been investing in bonds without specific designations by the investors. Today, their amount of investment in LTCB bonds has reached $7.5 billion while Mr. Sugiura was the Chairman of LTCB"
Finance Minister Miyazawa was the one who introduced Mr. Sugiura to Sokagakkai. The MOF decided to protect the investors, but when they pay back the bonds, Sokagakkai will have difficulty in receiving it because their investment has no specific names of investors. If this happens, Sokagakkai's investment in LTCB bonds will be revealed. The Peace Party which is based on Sokagakkai will be in the same position as LDP and JDP which are afraid of revelation of scandal. Sokagakkai is expected to come through looking quite clean since they are accustomed to involvement in such financial/political corruption. The technique they use is simple: make sure you have plenty of other people/groups invloved in case something blows up, and remind them that if Sokagakkai goes down as a result of the scandal, then they will all suffer. As expected, the political parties will all stick together in mutual protection. In this way, Sokagakkai and their Clean Government Party will have their way, along with the LDP and JDP, and taxpayer money will be used again to pay for the damage they have caused. The Sokagakkai again walks away unscathed as usual, with the LDP and JPD (not to mention a huge wad of cash) in their hip-pockets. Steamed rice cakes or stock transfers and real estate holdiings? "YOU have taken the trouble to have your messenger bring ninety pieces of rice cake and fifty yams from Ueno Village in Fuji District of Suruga Province, to this cave on Mount Minobu in the village of Hakiri in Kai Province at the hour of the sheep [1:00–3:00 p.m.] on the third day of the New Year. At the seaside, wood is regarded as a treasure, and in the mountains, salt. In a drought, water is thought of as a treasure, and in the darkness, a lamp. Women see their husbands as their treasures, and men look upon their wives as their very lives. A king sees his people as his parents, and the people see their food as Heaven. Over these last two or three years a great plague has raged in Japan and perhaps half the population have lost their lives. Moreover, since the seventh month of last year, due to a terrible famine, people who have no relations and live far from human habitation, and priests living deep in the mountains, have been finding it hard to sustain their lives. Furthermore, I, Nichiren, have been born in a country that slanders the Lotus Sutra and am like Bodhisattva Never Disparaging in the latter age of the Law of Awesome Sound King Buddha. Or I am like the monk Realization of Virtue in the latter age of Joy Increasing Buddha. The ruler detests me and the people hate me. My clothing is thin and food scarce. Padded cotton clothing seems like brocade, and greens I think of as sweet dew. Moreover, since the eleventh month of last year, the snow has piled up and cut off the mountain path. Though the New Year has arrived, the cry of birds comes my way, but no visitors. Just when I was feeling forlorn, thinking that if not a friend, then who would visit me here, during the first three celebratory days of the New Year your ninety steamed rice cakes appeared, looking like the full moon. My mind has brightened and the darkness of life and death will lift, I am sure. How admirable of you, how admirable! It is said that Ueno, your deceased father, was a man of feeling. Since you are his son, perhaps you have inherited the outstanding qualities of his character. Blue dye is bluer even than indigo itself, and ice is colder than water. How wonderful it is, how wonderful! Twelve dollars initial down payment for an SGI no-Honzon and then a comprehensive SGI Sustaining Contribution plan followed by Planned Giving [stealing of your children's estate]. Stock transfers and real estate preferred. Many suicides among SGI members? I have been chanting for almost 19 years, but right now i've reached a stage where I have been seriously contemplating suicide, and I truly need a fellow practioner's great & truly storm breaking experience of success. To all non Buddhists, to people wanting to wish me well, etc THANK YOU. But i still wish to hear from fellow members." Not one SGI member responded to Simon's question. I will respond with a question and an answer. Question: How it is possible that after 19 years of chanting an SGI members could be so despondent as to contemplate suicide? I promise you that after 90 days of a sincere effort to master the faith and practice of Nichiren Daishonin based on the Lotus Sutra [not Ikedaism], your sadness will disappear like dew in the noon day sun. Question 1. During major activities, lasting 3, 4, 5, or more days, such as visits by top Japanese senior leaders and culture festivals, are the youth division members still "encouraged" to support these activities for days on end with only a bare minimum of sleep [with some members undergoing nervous breakdowns and other major and minor mental and physical health breakdowns]? Question 2. Are the YMD still "encouraged" that behind the scenes activities such as standing in a remote corner of a parking lot for 4, 5, or more hours, sometimes under the blazing sun and not seeing a soul, is creating value in one's life? Question 3. Why, when general members suffer a serious health problem, is the community center neither opened nor are there mass Daimoku campaigns but when a leader is sick everyone is "encouraged" to chant for hours? We are all Buddhas, neh? Question 4. When a general member dies a horrible death, why are there rumblings about his or her faith but when a leader dies a horrible death he or she is treated as if he or she were a living Buddha? Question 5. Are there many suicides among members and former members? If not, why the SGI depression awareness campaign in Australia? Mark: Tientai's method is based on contemplative insight. Kanjin in Nichiren's Lotus Sutra Buddhism is observing the mind through chanting Namu Myoho renge kyo to the Gohonzon. The Nichiren mandala is the written words of the Buddha. We read the Sutra through the eyes of faith in the words of the Buddha and Nichiren Daishonin, not through the words and conceptions that derive from our mind. If the doctrine is flawed, faith will be flawed. SGI's and Nichiren Shoshu's doctrines are flawed. Therefore, the members' faith is flawed. Believing that a living mentor or High Priest is required to attain Buddhahood is the most noxious poison for one's faith. Myoho renge kyo is the perfect doctrine. Shakyamuni Buddha and Nichiren Daishonin are the perfect teachers. We maintains perfect doctrine through the Sutra scrolls and writings of Nichiren Daishonin. Identifying Nichiren as Original Eternal Buddha is the conception that derives from the mind of a common mortal. The Lotus Sutra and Nichiren identify Shakyamuni as the Original Eternal Buddha, the conception that derives from supremely and perfectly enlightened minds. Your rationale for altering, distorting, and misrepresenting the teaching too derives from the mind of a common mortal. “They cling to incomplete doctrines and are attached to receiving alms and being treated with deference; they recognize only false doctrines, distance themselves from good friends, approach with familiarity such slanderers who delight in attachment to the teachings of the lesser vehicle, and do not believe in the great vehicle. Therefore they slander the Law of the Buddhas. SGI senior leader Jim Celer: I'm one of his followers. I don't believe he is an earthly incarnation of a saint, and I've never suffered wrath, god-like or otherwise. George: So says Celer in this newsgroup. However, when you read his writings in the World Tribune, one finds an avid Ikeda worshipper who is well qualified to receive the brown nose of the month award. Another instance of the SGI proclaiming publicly a view that is at variance with its actual beliefs. In the August 15, 1997, World Tribune on p. 2, Celer states: "SGI President Ikeda has always gone first in showing us how to apply the Daishonin's Buddhism to ourselves and society. If 'I am the SGI- USA,' I must absorb his guidance and do my part to make this the model organization for the world, to look for responsibility and be successful in fulfilling it." In an article from the World Tribune of April 4, 1997, Celer states (paragraph breaks omitted): "Reflecting on my own practice, I see I have not quite managed to build a 'diamond-like body.' [as advocated by Ikeda] Why not? President Ikeda gives me an answer: 'For half a century, except for a 10-day period when I was ill, I [Ikeda, not Celer] have not rested for a single day. I have worked unceasingly, solely for kosen-rufu and the happiness of the members. I have exerted myself tirelessly in action and deed. And I have written prodigiously' (p. 11). After 25 years of practice, of course, things have changed immensely, and I [Celer, not Ikeda] live in what might be called 'comfortable' conditions: money, a nice house, a loving wife, and my child doing well in school. Many members are beginning to look for and take responsibility. So by focusing my eyes a certain way, I can believe that 'there's nothing for me to do today.' Yet President Ikeda never feels this way." After recounting two instances in which Celer alleges that he was motivated by Ikeda's guidance, he concludes: "So now, owing so much to this man, knowing that he is tireless in his efforts and knowing that there are still so many people who do not know of or understand the greatness of Nichiren Daishonin's Buddhism AND [emphasis added] the organization that propagates it, how can I feel comfortable? After all, I have a lifelong mentor who every second demonstrates that the way to build a 'diamond-like body' is to 'refute that which is erroneous and spread the True Law'"
It appears to me that even an obviously diligent SGI member like Jim is expected to feel like the lowest of lowlives in comparison to the peerless, self-proclaimed perfection of the 20th Century Buddha. In other words, the member is merely a nothing who can only be redeemed by the magnificence of Daisaku Ikeda. Perhaps this fills Jim with "hope and determination," as he later states in his article. I always found this type of thinking oppressive, and am glad to be away from it. Still, I can't quite get over the slander I've experienced at the hands of SGI members for asserting for 20 years what they are just beginning to assert now: That the DaiGohonzon is fake and the Eternal Original True Buddha is Shakyamuni Buddha. I think that I wouldn't even accept their apology were it offered. Then, there are the matters of: The blasphemy of Ikedacentrism; interfaith; and the inordinate and unconscionable alms accepted by the top SGI leaders to perform the work of the Buddha and The Supreme Votary that Shakyamuni and Nichiren did for food, clothing, and shelter. These aberrant SGI principles would be abhorrent to the Master of Teachings Lord Shakya and the Supreme Votary of Lotus Sutra. They certainly are abhorrent to the disciples and believer's of Nichiren. So the battle goes on even today. Especially in cases of financial difficulty, when a member is encouraged to contribute immediately, this cause will give the member an immediate surge of excitement and the confidence to continue fighting to contribute. This means to determine to save a certain amount every day and to reach this goal by cutting back on regular spending habits. One member broke down her total goal into daily increments, determining to save $12 a day for a year. In this way she was able to attain her goal of $4000. By opening our own hearts and sharing our experience, we can warmly encourage members who are hesitant to contribute. As an example, one WD Chapter Chief had a member who decided to run away from all her problems. She bought a one-way ticket to San Francisco. Based on her WD chief's warm and confident guidance to take this opportunity to fight to change her fortune by contributing to the Special Zaimu [money collection], she cashed in her bus ticket and gave all the money to Special Zaimu [money collection]. Within 24 hours, she was offered a job which came with a new apartment. One member's husband surprised her with a gift that amounted to many times her goal of contributing. he told her he had been saving the money for many months after hearing her say how much she wanted to go to France. Of course, she gave **all** the money to special Zaimu! You can tell from these experiences how much everyone enjoyed [sic] this special Zaimu Campaign. I'll bet! Getting people to give $4000 in one lump sum x how many members? Sounds very enjoyable [for the high salaried top leech leaders]..
"Sensei...," she began hesitantly, as if wondering how to broach a difficult subject. "Actually, Yukiko Gilmore and some of the others have collected a dollar from each member because they want to treat us to dinner....Shin'ichi's face clouded when he heard Kiyohara's words. "That won't do" he said. He sent for Yukiko Gilmore and proceeded to give her careful and detailed instruction on this point. "By announcing that you have decided to collect money to buy me dinner, you end up creating an atmosphere where everyone will feel they should comply even if they don't want to. Therefore, you may say it's everyone's wish, in effect it will be half compulsory. This may actually cause some people to harbor mistrust toward the Soka Gakkai. "Even thought the original intent may have been sincere, it could quite easily throw the member's faith into confusion. Therefore, leaders must take great care never to collect money from members. In the Soka Gakkai, we are very strict about money matters, if anything, tending towards over-cautiousness. "Although it may seem like I am being very harsh, I want you to take the money and respectfully return it to each person, carefully explaining to each the reason why." Shin'ichi was fully aware that her actions had been well intentioned. Thus the thought of having her apologize and return the money to each member pained him. However, if she was to lead the organization, she had to learn the Soka Gakkai's strict attitude towards money matters. Otherwise, there was a possible danger that some major problem over money might erupt in the future. SGI is a duplicitous evil organization headed by a conman who would take every last penny of your hard earned dollars if he could..